Journey into the great outdoors with Flo and Wendell in this second book starring the canine siblings. Flo thought her family's vacation together was just grand; her little brother Wendell, however, did not (he didn't get to use his souvenir hatchet even once), so Flo promises him a camping trip of his own. Equipped with a map, a compass, and two well-stocked backpacks, the pair sets off into the wilderness. Any book from artist, photographer, and filmmaker William Wegman is cause for celebration, but doubly so when it stars his adorable Weimaraner puppies (Those velvety ears! Those bright blue eyes! ), as in this book for readers up to 8 and dog lovers of all ages. 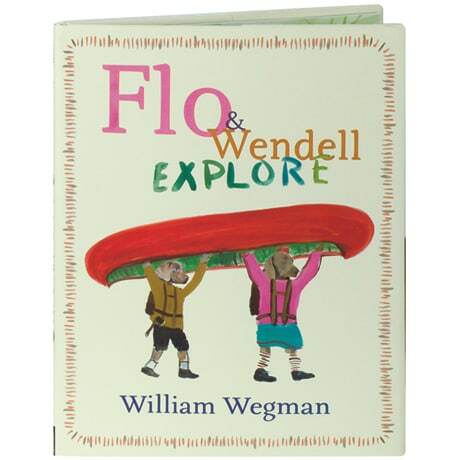 Wegman's real-life pups Flo and Topper lend their comically stoic expressions to his painted cartoons of big sister Flo and little brother Wendell, whose occasional flashes of sibling rivalry are not enough to displace their shared sense of imagination, adventure, and camaraderie. And as it turns out, whether pitching a tent, almost catching a fish, or facing down a bear (which might have been just a scary rock), Flo and Wendell make a pretty good team (even if they never actually leave their neighborhood).